" Mackie Doyle is not one of us. Though he lives in the small town of Gentry, he comes from a world of tunnels and black murky water, a world of living dead girls ruled by a little tattooed princess. He is a Replacement, left in the crib of a human baby sixteen years ago. Now, because of fatal allergies to iron, blood, and consecrated ground, Mackie is fighting to survive in the human world. Mackie would give anything to live among us, to practice on his bass or spend time with his crush, Tate. But when Tate's baby sister goes missing, Mackie is drawn irrevocably into the underworld of Gentry, known as Mayhem. He must face the dark creatures of the Slag Heaps and find his rightful place, in our world, or theirs.Edward Scissorhands meets The Catcher in the Rye in this wildly imaginative and frighteningly beautiful horror novel about an unusual boy and his search for a place to belong." I have read some great reviews for this book, and it seems like the kind of book I would really enjoy. I am so looking forward to it. i am looking forward to this a lot - preordered it ages ago! I am looking forward to this one as well. It sounds really intriguing and unique! Good Morning, I was reading posts in book blogs this morning and came acroos yours. I really enjoy what you are doing. 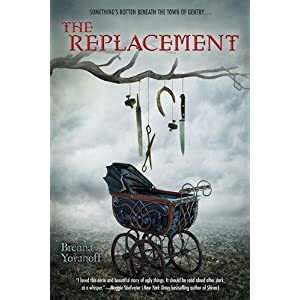 The Replacement sounds like a dark and yet good book It looks like a must to put on my TBR list. I am now following.